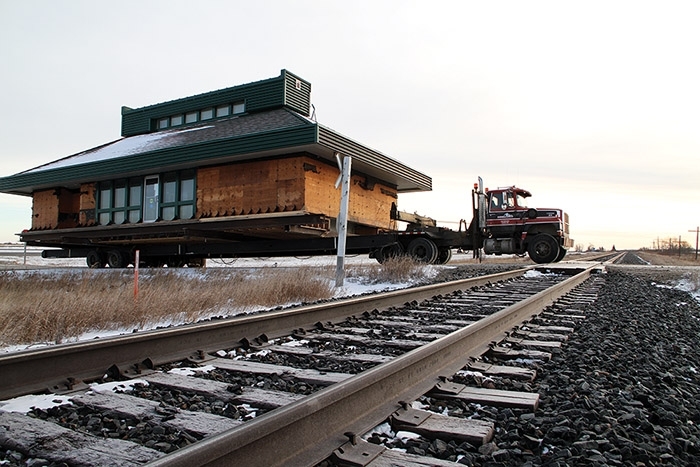 The new clubhouse for Pipestone Hills Golf Club, which is the former Tourism Saskatchewan visitor reception centre from the Manitoba-Saskatchewan border, crosses the CP Main Line just south of the Trans-Canada Highway on its way to the golf course. The new clubhouse for the Pipestone Hills Golf Club was moved from its former location on the Manitoba-Saskatchewan border, where it had been the Saskatchewan tourist reception centre, to the golf club in the Pipestone Valley on Friday. The golf club purchased the building after the provincial government decided it no longer needs a tourist reception centre on the Trans-Canada Highway. A foundation was prepared at the golf course, and an addition will be built onto the building. The golf club blew past expectations and raised $75,000 at its first annual Raise the Roof golf tournament in the summer to help cover the costs of the new clubhouse. The tournament is planned as an annual event to help pay down the costs of the new clubhouse. Pipestone Hills Golf Club has about 150 members. The golf club executive believes the new building will allow the club to attract many more private functions. The large building had to be moved along a less than direct route to get to the golf course. It was carried south along the border road to Highway 48, west to Grid 600, north to Fleming, west along Range Road 131 and south on Highway 8 to the golf course.